I have a love/hate relationship with public speaking. Or maybe it’s a terror/exhilaration relationship. Anyway, it’s a part of my job that runs the gamut from stressful and draining to highly rewarding. Last week, one of the voices in my head was reminding me of this responsibility as I was delivering what’s now called a “live, online presentation” — formerly known as a webinar — on how to lead from the middle for the World Business and Executive Coaches Summit. For video presentations, I stand at my desk, talking into a camera. I distract myself, worrying that I can’t adjust to what the audience needs because I can’t see them, and missing the typical in-person feedback of facial expressions, restlessness, even the dreaded phone-checking! I can’t tell if people need more examples, or aren’t responsive to a particular explanation. And since I’m only hearing my own thoughts and only seeing what’s in my mind’s eye, it’s easy to freak myself out about what I’m saying, how I sound, whether I’m gesturing too much, and whether anyone cares! Here are some of the things I’ve learned to do to keep myself calm and make the presentation process more tolerable. Have a team — even if you work solo. Develop at least a passing relationship with the organizers and/or AV staff so you feel like someone’s got your back. WBECS, for example, has a fabulous team that works hard to help you feel supported and cared for. 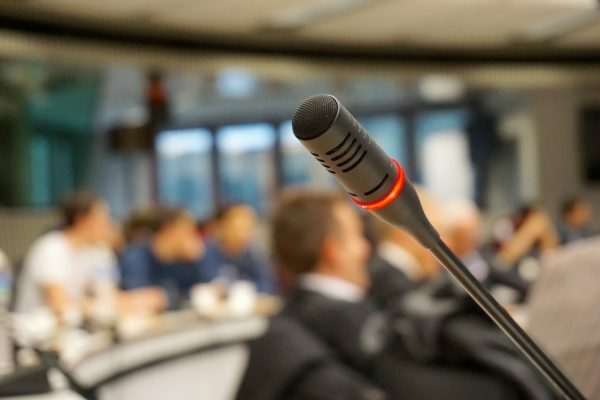 On premises, even when a conference staff is harried or not that interested, the folks who do AV are usually thrilled to get a little personal attention from you, and will reciprocate in kind. Know your purpose. Remind yourself that the reason you’re there is to use your content to help the audience. It’s about them and their needs, not you and yours. Focusing on why it’s useful for them to learn a particular tip takes the spotlight and the pressure off you. Your job is not to be brilliant or charismatic. It’s to ensure that they come away with something they can use or think about to help themselves. Corral your content. When I was struggling with drafting my TEDx talk, my colleague and friend Dorie Clark, an internationally-known marketing strategist, counseled me not to try to share every single valuable concept on the topic, because there would be plenty of other opportunities to make other points and tell other stories. She encouraged me to focus on the structure, and I simplified the content so that the crucial points were highlighted and easy to absorb. This way, the audience would walk away knowing they got something, instead of feeling lost in a haze of potentially useful but confusing information. Connect with your audience any way you can. It helps to remember that “the audience” is really many separate individuals — people I might actually like and want to be with. In person, I try to stand at the doorway to the session room and greet and welcome people on the way in — for me, that’s being a good host. So if I’m only on camera, I try to think of individuals in the audience that I’ve met before or have corresponded with; that way, I feel I’m talking to them and trying to give them what they came for — even if I can’t see their reactions. Stand and deliver. My friend Deborah Grayson Riegel, an expert on executive communication, always emphasizes the essential role of practice in getting the content across and helping the audience feel comfortable to take it in. No matter how meaningful your points are, they’re irrelevant if you can’t put them across. I used to fall into the trap of writing and rewriting until the last minute, but I’ve learned how much the physical practice helps with timing, with confidence, and even with freeing up a portion of my mind to evaluate any compelling anecdotes or quotes that come to me on the fly. Answer and respond. By virtue of their attendance and interest, I believe audience members have a “call” on you. Whether they ask questions as part of your session or get in touch on social media, via LinkedIn requests, or directly by email, it’s only courteous to allocate the time and effort to provide some individual attention. Answering questions is another way to make sure you’re providing something of value. I still get nervous when I speak, and I don’t expect that to go away. I consider it a marker for how much I care, and how seriously I take the responsibility of having an audience. And when I get freaked out about staring into the unresponsive eye of the camera, I laugh at myself and remember that at least this way I can’t fall off the platform or trip over the mike cord, which I’ve actually done live and in-person. But most of all, I remind myself that the nerves are worth it: They juice me up so that I can create a real connection, convey an important message, and try to make a difference.